One of two Dallas police officers critically wounded in a triple shooting at a Home Depot Tuesday afternoon has died, authorities confirmed Wednesday. Officer Rogelio Santander died at 8:11 a.m. Wednesday after succumbing to his injuries, Dallas Police Chief Renee Hall said at a morning news conference. The 27-year-old is the ninth North Texas officer to be killed in the line of duty in about two years, The Dallas Morning News reported. The second wounded officer was identified as 26-year-old Crystal Almeida. She and a Home Depot security guard, identified as Scott Painter, were in critical condition after surgery. 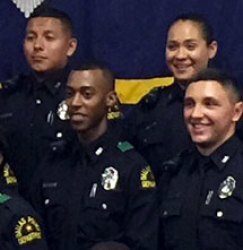 Dallas Police Officers Rogelio Santander and Crystal Almeida were in the same graduating class from the police academy, DPD confirmed. 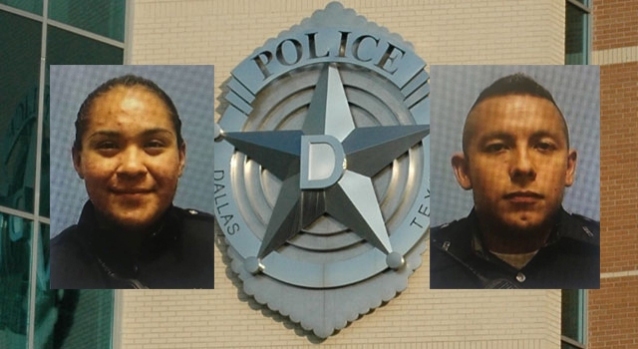 Santander and Almeida graduated from the police academy together and have been partners their entire time with the department, an officer told NBC DFW. Police arrested Armando Juarez, 29, on a murder charge, two charges of aggravated assault on a police officer and two previous felony theft charges. He was taken into custody shortly before 10 p.m. Tuesday after a lengthy car chase involving officers of various law enforcement agencies. According to an arrest affidavit, Juarez was at a Home Depot in northeast Dallas about 4 p.m. Tuesday when he was acting suspiciously and possibly attempting to commit a theft at the store. An off-duty officer was alerted by loss prevention officer Scott Painter, the affidavit said. Juarez was detained. The off-duty officer then determined Juarez had an active warrant. The off-duty officer called for on-duty officers to come to the location to confirm the warrant. Crystal Almeida, left, and Rogelio Santander, right, are both three-year veterans assigned to the Northeast Division. Santander and Almeida arrived at the loss prevention office and the off-duty officer confirmed the warrant in the squad vehicle, the affidavit said. The off-duty officer was returning to the loss prevention office at Home Depot when he heard "shots fired" broadcast over the police radio. He saw Almeida, Santander and Painter on the ground of the office with apparent gunshot wounds, the affidavit said. Body camera footage showed Almeida and Santander were trying to place the suspect into custody when he removed his hands from his pockets, drew a handgun and shot the officers, the affidavit said. Almeida, Santander and Painter were transported to Presbyterian Hospital. Almeida and Santander were both three-year veterans of the Northeast Division. Flags flew at half-staff at Dallas City Hall and the Northeast Patrol Division, where to two officers were based, after the announcement. "Thank you to our community and everyone at Presbyterian Hospital for your love and support during this time," the Dallas Police Department said in a statement. "Again, we ask that you please continue to pray for Officer Santander’s family and our department as we all try to cope with this tragic loss." Michael Mata, President of the Dallas Police Association, had previously said Wednesday morning that Santander was "holding in there." "We've talked with the doctors and the prognosis is not real positive," Mata had said regarding Santander's condition at the time. He added that Almeida is "doing better than they suspected, but she is holding on." "I don't want to say she is stable, but she is, I think, out of the darkest part," Mata said. Juarez's bond has been set at $1,010,000. "We got our man," Dallas Mayor Mike Rawlings said at a late-night news conference. Police captured Juarez after he led them on a brief high speed chase near downtown Dallas. It eventually ended on a dead end street on South Versailles near Holland Avenue. Juarez crashed through a fence on John Scott Tinsley's property before backing into a truck and coming to a rest at his front steps. "It ends right at my doorstep. It’s very bizarre. But it’s equally as bizarre and sad that these shootings keep happening. People get slain and families have to deal with it and loved ones lost," said Tinsley. NBC 5's Jack Highberger spoke with Juarez's grandmother, Janie Longoria, Tuesday night. She called the shooting "devastating" and said her family is "all for the blue." "We back up the police officers," Longoria said, choking back tears. "And I couldn't believe that one of the members of the family would have done that." Gov. Greg Abbott also tweeted about the incident. In 2016, four Dallas police officers and a Dallas Area Rapid Transit officer were shot dead by a sniper in an ambush that came toward the end of a peaceful protest over the police killings of black men that had occurred in other cities.